Easy To Use – Download, install and then login with your Facebook username and password – easy! 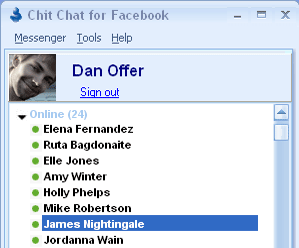 Instant Message Notification – Lets you know when you receive an instant message. 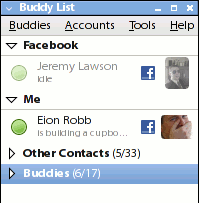 This is a Facebook chat plugin for Pidgin and libpurple messengers. It connects to the new Facebook Chat IM service without the need for an API key. It was created by Eion Robb in May 2008 and has had major code additions by Casey Ho and Mark Doliner who joined the project at the end of 2008. This plugin is in no way associated with Google nor the Summer of Code, other than being hosted on the Google Code website; it was written purely during the spare time of the above-mentioned developers. Stay up to date with everything happening on your Facebook, Twitter, MySpace and LinkedIn accounts. Receive alerts of events such as new friend requests, messages, group invites, etc. The social network InfoBox gives you a real time NewsFeed of what your friends are up to. Everything from new photos, to status updates, to upcoming birthdays is just a click away. Set your Facebook, Twitter and LinkedIn status right from Digsby. Yoono is an easy to use application that allows you to connect to all your social networks and instant messaging services – in one place. Get all your friend updates, update your own status, and easily share stuff with your friends. Connect to all your social networks and never miss another status update from friends or family. Update your status across all your social networks at the same time. All your IM services in one application – no more logging on to multiple services.